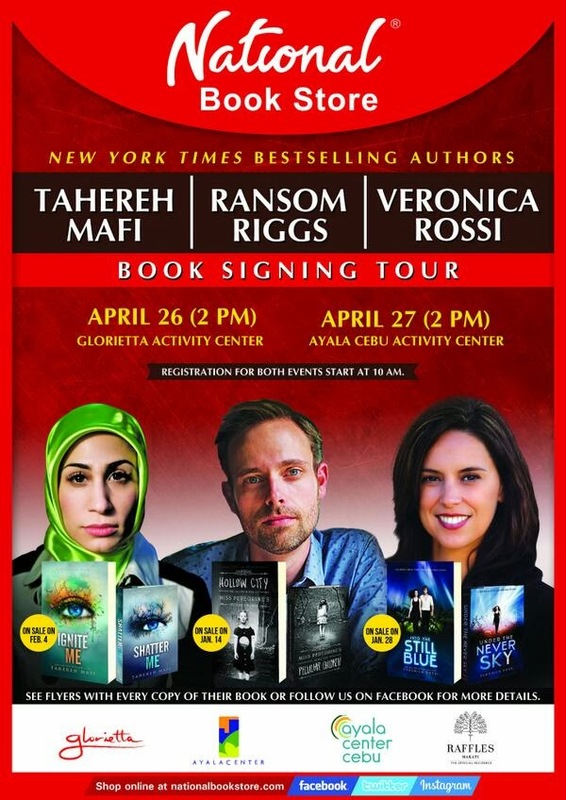 Registration opens at 10:00 am on April 26 at the Glorietta Activity Center and 10:00 am on April 27 at the Activity Center of Ayala Center Cebu. Each guest will be asked to fill out the registration form upon arrival. Separate registrations for each event is required should you wish to attend both events. First come, first served. Yes, as long as the books were purchased from National Book Store, Bestsellers or Powerbooks. No. You can buy books before or during the events. Can we have our photo taken with the authors? Yes, you can have your photo with each author when they sign your book. However, we strictly allow only one photo per person for each author. 1. Every purchase of “The First Phone Call from Heaven” (TFPCFH) by Mitch Albom from National Book Store, Powerbooks, Bestsellers or National Book Store Express shall come with a Mitch Albom flyer. Please note that the flyer is not a guaranteed signing pass. 2. There is no limit as to how many copies of TFPCFH can be purchased by a customer. 3. 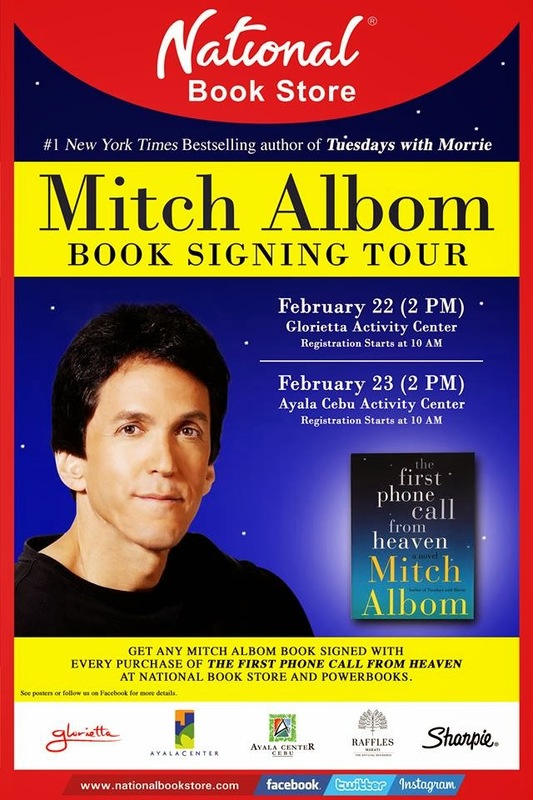 On the day of the event, only guests with an original Mitch Albom flyer that came from a TFPCFH book bought at National Book Store, Powerbooks, Bestsellers or National Book Store Express, will be allowed to register. First come, first served. Registration at both events will start at 10 a.m.
5. Upon registration, customer shall get their numbered Signing Pass. One (1) TFPCFH book = One (1) Mitch Albom book of your choice to be signed. For example, if you bought three (3) copies of TFPCFH and have three (3) flyers, you may have three (3) books signed (e.g. One (1) Tuesdays with Morrie + One (1) The Five People you Meet in Heaven + One (1) The First Phone Call From Heaven). 6. Mitch Albom will only sign books. T-shirts, DVDs, CDs and other merchandise will not be signed. There shall be no personalization of the books. 7. There is no preset limit as to how many people can have their books signed and every effort will be made to have as many books signed as possible. However, should there be an excessive number of people, National Book Store reserves the right to limit (a) the number of people who can have their books signed or (b) the number of books each person may have signed. First come, first served. 8. Guests may take photos during the signing session. However, we strictly allow only one photo per person. Oh my god...you guys in Phillipines are so lucky. I wished some cool authors would come to for a book signing in Malaysia.